Haji, B., Haji, A., Rahmati Tavakol3, A. (2008). Scheduling Accumulated Rework in a Normal Cycle: Optimal Batch Production with Minimum Rework Cycles. Journal of Industrial and Systems Engineering, 2(3), 236-249. Babak Haji; Alireza Haji; Ali Rahmati Tavakol3. "Scheduling Accumulated Rework in a Normal Cycle: Optimal Batch Production with Minimum Rework Cycles". 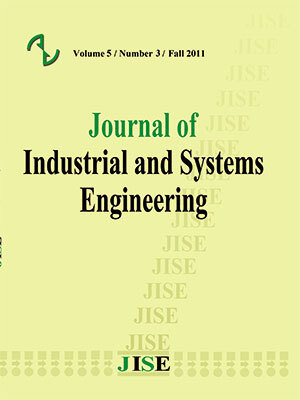 Journal of Industrial and Systems Engineering, 2, 3, 2008, 236-249. Haji, B., Haji, A., Rahmati Tavakol3, A. (2008). 'Scheduling Accumulated Rework in a Normal Cycle: Optimal Batch Production with Minimum Rework Cycles', Journal of Industrial and Systems Engineering, 2(3), pp. 236-249. Haji, B., Haji, A., Rahmati Tavakol3, A. Scheduling Accumulated Rework in a Normal Cycle: Optimal Batch Production with Minimum Rework Cycles. Journal of Industrial and Systems Engineering, 2008; 2(3): 236-249. In this paper we consider a single machine system that produces items part of which are defective. The defective items produced in a time period, consisting of several equal cycles, are accumulated and are all reworked in the last cycle of this period called the rework cycle. At the end of the rework cycle the whole process will start all over again. The first significant objective of this study is that, for the ease of production and resource planning, the rework cycle has to have the same length as the other cycles. The other objective is that the number of rework cycles be as small as possible, because of changeover costs needed for going from normal production to rework as well as special attention required for rework to satisfy the zero defect criterion. For this system, assuming no shortages are permitted we drive the total system cost per unit time and obtain the economic batch quantity which minimizes this total cost. production; International Journal of Operations and Production Management 10(3); 69-77. Journal of Systems Science and Systems Engineering 17(2); 230-240.
produced; Production Planning and Control 12(6); 584 - 590.
process at a single-stage production system, Computers & Industrial Engineering 47; 77-89.
control; New York, John Wiley and Sons. schedules in a production system; Management science 33(9); 1125-1136.
process corrections and rework; Management Science 38(9); 1314 -1328.
production systems with scrap; Production Planning and Control 8(6); 586-596. Nahmias S. (2001), Production and Operations Analysis; Mcgraw-Hill, (4th ed), new York. Operations Research 34 (1); 137–144. quality; International Journal of Production Economics 64; 59–64. yield; IIE Transactions 22(1); 41-47.